A great rift has opened in the Witchfinders Keep, many have been sent to find out what has happened, and all have failed. 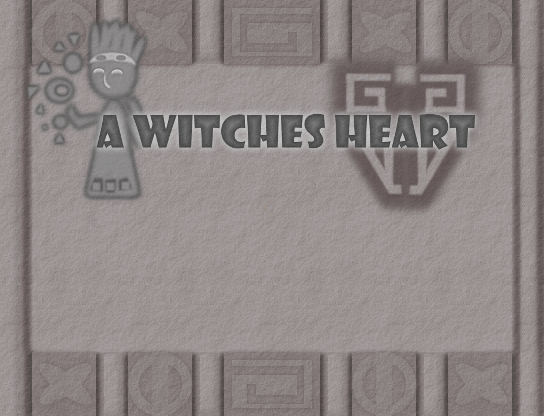 You are the last hope for your village, entering the Keep to uncover the truth of A Witches Heart. 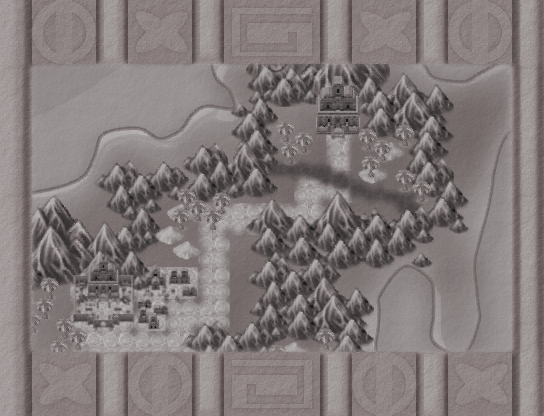 Welcome to Istolia Valley, a beautiful valley in the tropical country of Istolian, but the beauty has been marred; magical rifts expelling dangerous creatures from the Abyss have been opening. The largest of which has opened within the Witchfinders Keep. The King, haunted by the death of his only son to a magical plague many years before, has outlawed the use of magic, but since the rift opened his Witchfinders have all entered the keep, never to return. A Learn Skill feature for the main character, all other characters come with their own unique skills. Skills are leveled in such a way that the player can affect battles, eg. using the intimadate skill to make enemies flee the battle, or sheild to buff defence, or at higher levels to deflect enemy attacks etc. A series of different puzzles along similar themes. A Gem system to add skills or defensive buffs etc. This is a further game in the World of Thorntop, my fantasy game world, set in a part of that world that is very ancient in it's traditions and designs. 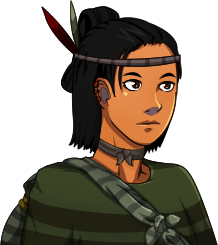 In our world they would be known as the Aztecs or Mayans, tribes we don't really see nowadays. 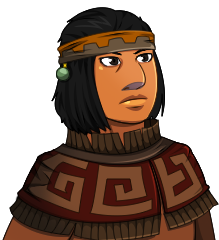 To this end I decided to use the wonderful Aztec character set *[Copyright](C) Degica, Co. LTD*, and also to make my own Aztec like artwork for certain scenes in the game. I hope this will interest the players and make my game stand out further. As the IGMC is looking for potential in the game to turn it into a fully fledged commercial game, Ii feel I should talk about the potential of the game. 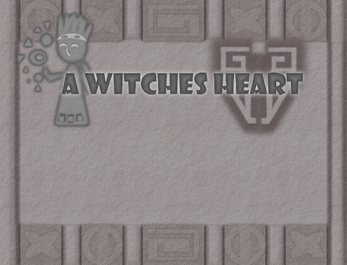 The game I will be submitting will start at the Witchfinders Keep, however there is potential to start the game at the main characters village, allowing for more interaction with the world, and to find out more about the history and the people that live there. I hope that you will all see this potential. Here's my Secret Santa review! I found the introductory cut-scene intriguing and the overall story was interesting as well. I thought most of the dungeon puzzles were fine (though I and another person couldn't solve the one on the left stone tablet in the room with the sunbird; I found it necessary to use the hints on the other two puzzles for this room). The mapping was good, and the graphics and music were very nice and matched the setting of the game, and I liked the windowskin as well! I think the skill selection screen was nice in the sense that you could see how many skills could be unlocked next, but it would be useful to see the names of the skills on the screen so that you don't have to interact with each one to know what they are. I would also show how much gold you have when choosing to purchase a skill. It would be nice if the moving pieces stayed in the same place after they've been moved and you return to the same map later. I hold down SHIFT very often to move faster, but this also closed messages immediately so I didn't get the chance to read some of the automatically-triggered messages. I could climb up a couple of the walls; if you would like screenshots of which walls, please PM me on the forum. I would suggest showing the message about skills requiring gold only once or twice; it was a little tedious to see it every time I talked to the item merchant. For the keyboard instructions and map screens, I would move the "Next" or "Close" buttons to the bottom right; it obstructed my view a little. It didn't seem like the monsters had different strengths or weaknesses, so I didn't think the battles were very interesting or challenging (I just used the same skills over and over again like 'Attack' or 'Bludgeon' to get their HP down). I couldn't use the multi-enemy skills ('Sweep' and 'Flurry', for example) despite having enough SP and there being multiple enemies on the screen. There were minor typos throughout the game (e.g., 'increses' in the description of the 'Evade' skill; first letter of some skill descriptions was not capitalized, riddle in the room with the sunbird should be "The Sunbird flies up... the rays of its wings...", etc). I thought the screen resolution was a bit small (though everything was readable and visible on my monitor), and there didn't seem to be a way to full-screen or resize the window. Also, perhaps a different font would lend to a more immersive experience? Anyway, I think many of these things are fixable, and I enjoyed your game in general! Good luck! Thank you for your review of my game! I really appreciate it! I’ll also remember to add a screen at the start explaining that you can change the weapon in battle. Flurry and sweep are stick skills, so you need to equip the stick for them to work. I’ll take your comments under advisement and thank you for reviewing my game!